Little cousin Camille and Paul Claudel, François Didier-Claudel is a true artist. 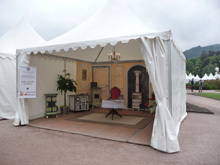 When a childhood friend entrusted him with the restoration of the stove of an inhabitant of Epinal and it is so spectacular that the client no longer recognizes his stove. 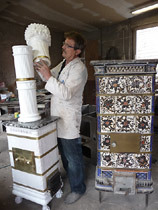 François became Restorer and creator of tiled stoves, activity that his grandfather had occasionally. Word of mouth will help François Didier-Claudel to a certain reputation. Thus, in its farm-shop, the number of tiled stoves require treatment of youth growing rapidly. Among its first customers, several Lords as the Countess de Saint-Seine to Dijon and the Comte de Mitry in the Meurthe-et-Moselle, but also the Faïencerie Saint-Clément in Lunéville rely on his skills. The rest of the story to a small side 'success story': François Didier-Claudel iterates through fairs and lounges with a very reasonable success, and then one day, in the race of side of Evaux-et-Ménil, he released his pans on the course. Then noticed by a journalist, an article was dedicated, then it is the turn of TV, the legend is born. In support of his restoration work, François has exceptional documentation where the works of art and collections alongside old catalogs and advertising, where the missing and forgotten models reappear between lines and engravings. Recently a new treasure to joined this wonderful documentation: a catalogue of 1913 where palettes of colours of the stoves are shelled, and where we rediscover the famous series Stanislas.